Dura-Vent's UL Listed Type B Gas Vent is top-notch. It has a precision twist-lock design that is fast and easy to install or disassemble - all with no fitting hassles. Dura-Vent Tpe B Gas Vent can be used to vent Category I gas appliances or whenever B-Vent is specified on the appliance label. It requires 1" clearance to combustibles. And it has a 25-year warranty - virtually unheard of with B-Vent! The inner liner is .012" aluminum and the outer wall is premium grade .018" galvanized steel. 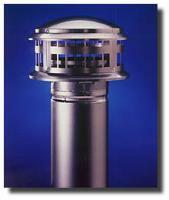 This vent is available in 3" - 6" diameters. In addition to the 6", 12", 24" 36", and 48" lengths, this system features many unique components. The 45 and 90 Degree elbows are adjustable. A swivel extension is available which makes lining up locking joints fast and easy when connecting elbows, tees, and Y's. We stock a variety of tees, tee covers, flashings, increasers, storm collars, firestop spacers, wall straps and slip connectors. There are also firestop supports for vertical installations and draft hood connectors that will be needed to mate to some gas appliances. For Venting Category-1 gas appliances only. 45 Deg Adjustable Elbow; B-Vent; 4"
90 Deg Adjustable Elbow; B-Vent; 4"
High Wind Rain Cap; B-Vent; 4"
0/12 - 6/12 Adjustable Flashing; B-Vent; 4"
Tall Cone Roof Flashing; B-Vent; 4"
Draft Hood Connector; B-Vent; 4"
Square. Firestop Support; B-Vent; 4"
Square. Firestop Spacer; B-Vent; 4"
Special Order- 2wk lead time. Combo Rain Cap; B-Vent; 4"